Navigation pole with Evoled 360° LED light - Pull-out angular version with stainless steel base, flat mounting. Light body: AISI 316 stainless steel. RINA and NMMA USA type-tested for vessels up to 12 m. Power: 12 V.
Navigation pole with Evoled 360° LED light - Pull-out angular version with stainless steel base, flat mounting. Light body: white plastic. RINA and NMMA USA type-tested for vessels up to 12 m. Power: 12 V.
360° mooring light is made of AISI 316 stainless polished steel. LED light for vessels up to 12 m. Power: 12 V, Length: 100 cm. Classic pole with combined lights, made of stainless steel. RINA type approval 360° light series. Clip-on installation onto the base; standardized for hulls up to 12 metres; mirror polished AISI 316 stainless steel base. Length: 100 cm. 105 cm Tri-color pole light. 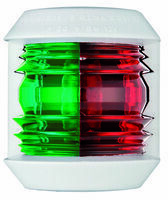 Red and green navigation light with stern light. Made of marine grade stainless steel 316 tubing with ABS plastic, polycarbonate lens and nitrite O-ring sealed light and a fibre nylon mix base. Visible distance: 2 nm. Length: 105 cm. Classic pole with combined lights, made of stainless steel. Features: Clip-on installation onto the base, standardized for hulls up to 12 metres, white plastic light and base. Power: 12 V. 10 W. Spare bulb code: 14.200.02. Classic 360° pull-out pole with Advance base. Made of polished AISI 316 stainless steel, fitted with AISI 316 stainless steel base and nylon rubber. The contact is activated by inserting the pole; when the pole is removed, the clip-on cover seals the hole. Pole length: 60 cm, Power: 12 V, 10 W.
Wall-mounting pull-out pole with flag holding eyelets, AISI 316 stainless steel pole, Height: 60 cm, Light made of white plastic. Classic 360° pull-out pole with Advance base. Made of plastic, fitted with AISI 316 stainless steel base and nylon rubber. The contact is activated by inserting the pole; when the pole is removed, the clip-on cover seals the hole. Pole length: 100 cm, Power: 12 V, 10 W. Spare bulb code: 14.200.02. Classic LED 360° pull-out pole with Advance base. Made of plastic, fitted with AISI 316 stainless steel base and nylon rubber. The contact is activated by inserting the pole; when the pole is removed, the clip-on cover seals the hole. Pole length: 60 cm, Power: 12/24 V, 1,7 W. Spare bulb code: 14.223.00. Independent 360° LED navigation light, rod with clamp, certified in compliance with COLREG '72. Batteries: 3 x AAA (not included). 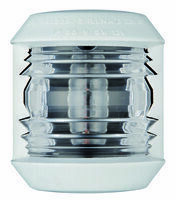 Independent 360° LED navigation light, with suction cup, certified in compliance with COLREG '72. Batteries: 3 x AAA (not included). 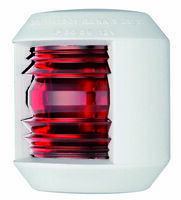 112,5° left side red light for vessels up to 20 m. Power: 12 V, Dimensions: 130 x 115 x 65 mm, Body: white plastic. 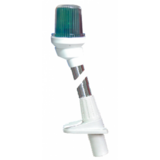 112,5° right side green light for vessels up to 20 m. Power: 12 V, Dimensions: 130 x 115 x 65 mm, Body: white plastic. 225° bow light for vessels up to 20 m. Power: 12 V, Dimensions: 130 x 115 x 65 mm, Body: white plastic. Sidelight red LED navigation light for use on vessels up to 20 m. IP56 watertight. Power: 12/24 V, Bulb: 1 W, Average lifetime: 10 000 hours. White polycarbonate body. 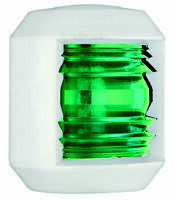 Sidelight green LED navigation light for use on vessels up to 20 m. IP56 watertight. Power: 12/24 V, Bulb: 1 W, Average lifetime: 10 000 hours. White polycarbonate body. 112,5° Utility Compact navigation light for boats up to 12 m. It`s special quality is distinguished for been powered by a small high intensity 5 W bulb, so that take minimum external space, low heat and low consumption. 2- screw mounting. Power: 12 V, Dimensions: 40 x 49 mm. 225° Utility Compact masthead light for boats up to 12 m. It`s special quality is distinguished for been powered by a small high intensity 5 W bulb, so that take minimum external space, low heat and low consumption. 2- screw mounting. Power: 12 V, Dimensions: 40 x 49 mm. 135° Utility Compact stern light for boats up to 12 m. It`s special quality is distinguished for been powered by a small high intensity 5 W bulb, so that take minimum external space, low heat and low consumption. 2- screw mounting. Power: 12 V, Dimensions: 40 x 49 mm. 225° Utility Compact navigation light for boats up to 12 m. It`s special quality is distinguished for been powered by a small high intensity 5 W bulb, so that take minimum external space, low heat and low consumption. 2- screw mounting. Power: 12 V, Dimensions: 40 x 49 mm. 360° Utility Compact navigation light for boats up to 12 m. It`s special quality is distinguished for been powered by a small high intensity 5 W bulb, so that take minimum external space, low heat and low consumption. 2- screw mounting. Power: 12 V, Dimensions: 52 x 84 mm. 360° mooring light is made of AISI 316 polished stainless steel. 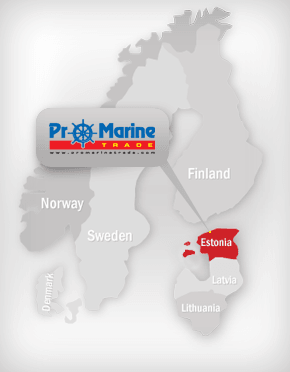 LED light for vessels up to 12 m. Power: 12 V.
Utility Compact 225° navigation light. Suitable for boats up to 12 metres. Its special quality is distinguished for been powered by a small high intensity 5 watt bulb, so that to take minimum external space, low heat and low consumption; 2-screw mounting. Compact 12 navigation light is made of mirror-polished AISI 316 stainless steel RINA type-approved for boats up to 12 metres. Spare bulb: 14.300.20.